Have you ever wondered what it would be to live in Africa? We all know that Africa belongs to some of the poorest nations in the world are in Africa. Rain 4 Africa 2011 aims to raise awareness and raise funds for the people living in East Africa, which has now been gripped by what is considered to be the worst famine crisis in the last 20 years. All proceeds and donations made during the run will go straight to the World Food Programme’s initiatives. Let's all help create awareness and raise funds for donation to East Africa, the region that is facing the worst famine crisis in nearly 20 years.Rain 4 Africa is a run for a cause organized by the Lifeline Foundation aimed to collect and bring help and save lives to the drought-stricken East Africa. This is a non-profit, all volunteer organized running event. 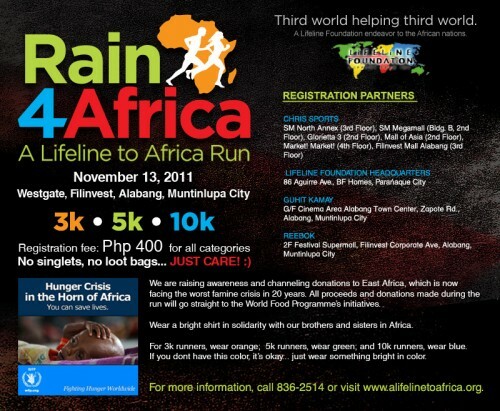 Rain 4 Africa – A Lifeline to Africa Run will be on November 13, 2011 at Filinvest, Alabang, Muntinlupa City 3. Registration fee for all of the races is at P400 per participant. Payments can be done through any EastWest Bank or directly at their registration partners. For more information about this event, you can visit the Rain 4 Africa website or contact Lifeline Foundation Support Team, Inc. at (632) 836-2514 or via email at info@ineedalifeline.org.